On Friday Sept. 14, the Liberty Arts Commission, in collaboration with William Jewell College and Corbin Theater, held the first Poetry on the Square event. Members of the Liberty community, including a few Jewell students and alumni, gathered from 7-9 p.m. in the quaint Corbin Theater to share their own poetry and listen to others’ poems. This was the second literary event produced by the Liberty Arts Commission and William Jewell College – the first being Arts Collide, which was held in Jewell’s Stocksdale Gallery in August. 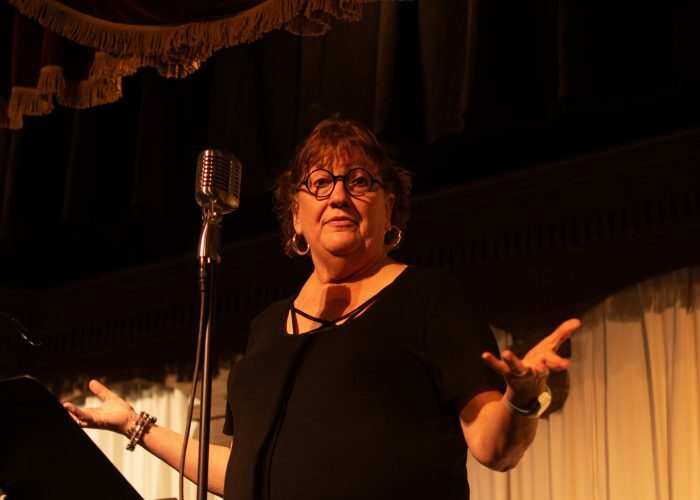 Carol Kariotis, one of the organizers of Poetry on the Square, spoke to the Hilltop Monitor about the Liberty Arts Commission’s increased focus on the literary arts. “We’ve started doing a lot more with literary arts besides the regular visual arts that we do. We wanted [Arts Collide] to be kind of a big kick off, and then we would like to have an open mic every month if we can get a following for it,” said Kariotis. The emcee for the evening was local poet David Arnold Hughes. “The reason I thought of [Hughes] right off the bat was because of his wonderful reading voice and his beautiful poetry,” Kariotis said. Hughes started the night by sharing one of his own poems entitled “Angels.” His enthusiasm and welcoming attitude made poets feel at home on stage throughout the night. This welcoming, accepting feeling was a central theme of the open mic. “Don’t feel shy about getting up [and sharing] because this is a place where we want to encourage new poets, [as well as] celebrate older poets,” emphasized Kariotis. Attendees of the event took these words to heart – throughout the night more than 10 poets performed a diverse collection of pieces. Some poets had a few open mics under their belt, while others shared their poetry for the first time. Some had self-published books of their poetry, while others read out of personal journals. Either way, everyone was met with generous applause after sharing their poems. One of the poets, Anna Borgert, senior English and history major shared about her experience. “It was much more comfortable and homey than I thought it was going to be. The audience, while small, was very comforting and receptive to new poets. Everytime a new poet read all of the older poets would say ‘Congratulations! Welcome home!’” said Borgert. 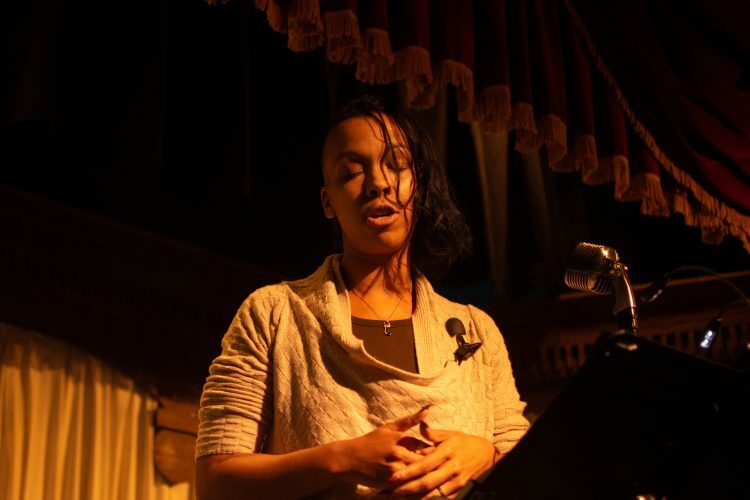 Recent Jewell graduate and local poet Rebecca Santiago, class of 2018, gave passionate performances of her original poems, and will also serve as the emcee for the October installment of the event. 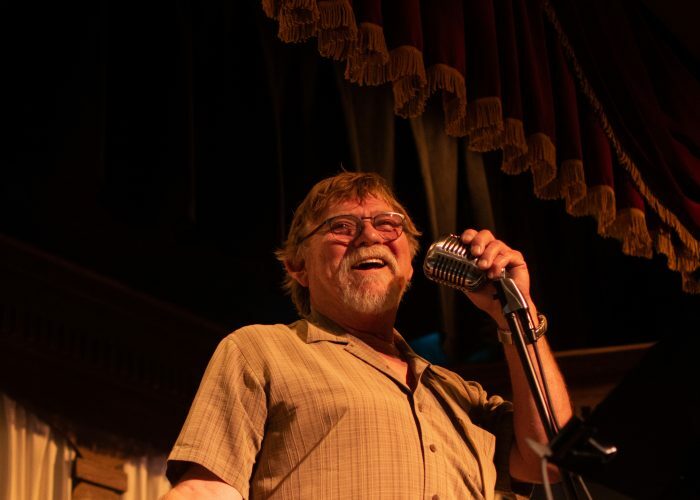 “[Poetry on the Square], in its early stages and as it grows, will allow those who are unsure of their voices to connect with themselves, the community, and fellow artists,” Santiago said. Liberty Arts Commission and Jewell are co-hosting another Poetry on the Square on Friday, Oct. 5 at 7 p.m. in Corbin Theater. Jewell students are encouraged to share their own poetry and other creative writing, or simply come and listen. Santiago looks forward to hearing from a diverse group of poets, amateur or seasoned. “Poetry should make you feel and then want to do. Laugh, cry, question, grow. From the Hilltop to the Square and beyond, this community has a voice and deserves to be heard,” Santiago said.